Debuting for his new club Inter Milan at the Juventus Stadium facing Serie A leaders Juve, German international Lukas Podolski must have prepared himself for a tough fought first game, but what he got to witness instead was a lot more than just good football. Starting the match on the bench, Podolski hardly managed to warm his bench-seat up before the hosts went 1-0 ahead in just the fifth minute thanks to a goal from Argentine striker Carlos Tevez. After a decent first half however the score remained the same at the referee's whistle, with the Bianconeri leading by one. 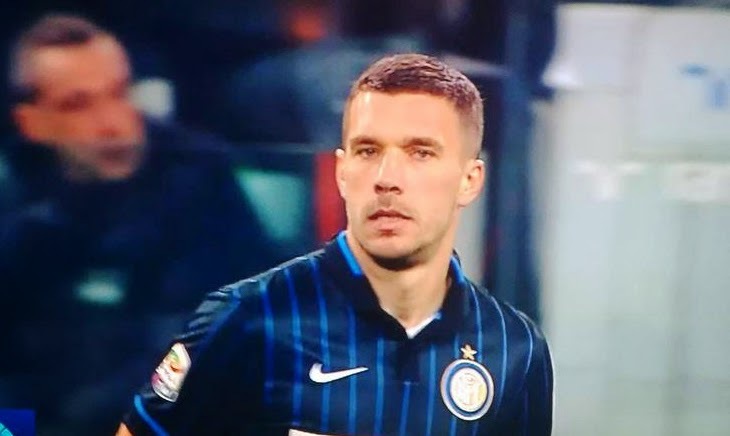 Just 9 minutes after the restart Inter manager Roberto Mancini decided to utilize his new World Cup winning footballer, slotting Podolski in as a replacement for Serbian international Zdravko Kuzmanovic. The German seemed to adjust well to the pace of the Italian game, controlling the ball on many occasions. In the 64th minute the German witnessed exactly what he most likely wished for since the first five minutes, a great pass towards Mauro Icardi inside the Juventus box and the Argentine made no mistake slotting the ball past Buffon for the equalizer. Podolski and his teammates would go on to scare the hosts on a number of occasions after that, coming close to scoring a winner, although in a number of instances they could have also conceded. Then, a bit of chaos. Scenes that perhaps were as welcoming as Lukas would have hoped for in his very first match with Inter. In the 86th minute a two footed challenge from Mateo Kovacic saw Podolski's side go down to ten men.